I had planned to keep blogging during this time, but I found that is difficult without an internet connection (thanks for that Comcast). 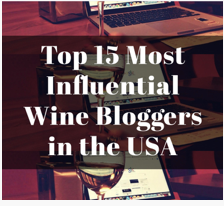 So, in the spirit of the Food and Wine Hedonist I have decided to mail it in and re-blog one of my more popular posts. Over the last several years, several online wine retailers have launched flash sale sites—It seems as though each of these sites operate in a similar manner, where they sell one wine at a time at a discount until (ostensibly), they sell out of the wine. As much as it pains me to admit it, it does seem that the flash site idea originated in the Commonwealth of Pennsylvania, perhaps the state that is the most hostile to the wine consumer. Several years ago, Jonathan Newman (with whom, coincidentally, I share an alma mater), who was Chairman of the PLCB, started the “Chairman’s Selection” Program. The PLCB is the second largest purchaser of wine in the world (it only trails the Province of Ontario), and Mr. Newman would approach wineries with the PLCB’s fat checkbook and buy out entire vintages of wines at a deep discount, passing on the savings to the grateful citizens of the Commonwealth (that was typed with more than an ounce of sarcasm since while the Chairman’s Selection program is “good”, the rest of the PLCB is atrocious). A few years later, in early 2007, Mr. Newman was forced out of the PLCB (the “Chairmanship” has become a political patronage position, it seems), and shortly thereafter he joined forces with the folks over at the recently formed Wines Til Sold Out (WTSO), the original flash site, which seems to operate under the same model as the Chairman’s Selection program. Either the winery approaches the store (or vice versa), looking to sell some wine that the winery has not been able to sell as quickly as they would like. They agree on a price that would enable the retailer to sell the wine at well below retail. The retailer buys all (or most) of the remaining stock. They then offer it on their site at a price that is very attractive to the consumer (usually between 20-60% off retail). So a wine that the winery was selling for, say, $30 in their tasting room, they sell to the online flash seller for perhaps $10, and it is then sold for $15-20 online. Shipping is usually free as long as you meet the minimum number of bottles (usually 3-6). The first question I had: Why would a winery do this? Well, there are several reasons, but getting an infusion of cash has to be near the top. They are also clearing out some inventory which was not moving for whatever reason. A new harvest could be coming in and they need the space or need to buy glass for the wine that is ready to be bottled, or just need to make payroll. At first I thought that the on-line retailers were preying on the wineries, particularly the smaller ones, who, in a desperate need of cash, would sell their wine far below market value. Recently, I have changed my opinion as it seems like everyone benefits from this model: the wineries get cash, the online retailer gets profits, and the consumer gets a good deal. Wines Til Sold Out (WTSO) —The Skinny: Perhaps the original (and likely the largest), WTSO posts a new wine several times a day from a nice variety of regions. Location: New Jersey (that’s on the East Coast in case you were wondering). Kudos: WTSO perhaps sets the standard for customer service–if there is ever a problem with the wine they will take care of it to your complete satisfaction. Caveat: WTSO also has a semi-secret “Platinum Deal” which runs concurrently with the “normal” deal. Frankly, I have not seen much difference between the two, but that might just be me. Last Bottle—The Skinny: Similar business model to WTSO, but Last Bottle does not have the same product turnover on its site (Last Bottle might have 2-3 different wines a day). Location: Napa Valley—which is why, perhaps, that Last Bottle seems to have more California wines. Kudos: Last Bottle has great customer service as well and they also offer a referral credit (if you make a purchase using the links on this site to sign up, I get a $20 credit, which is better than a sharp stick in the eye!). 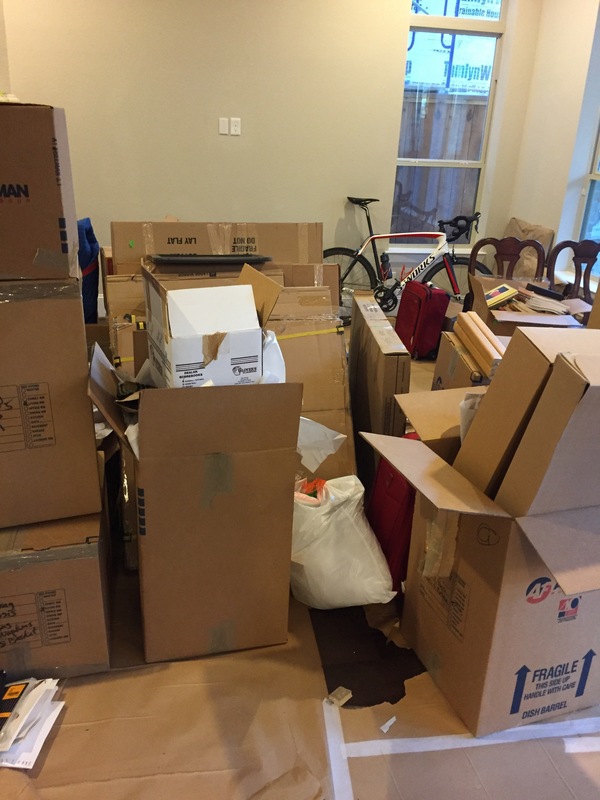 Caveat: Last Bottle still uses styrofoam to ship the wine–boo! You can read more about my love affair with Last Bottle HERE. More Kudos: Both WTSO and Last Bottle have periodic “marathons” where they go through 20-40 different offers a day. WineShopper—The Skinny: WineShopper is an outlet of sorts of Wine.com, which promotes itself as the No. 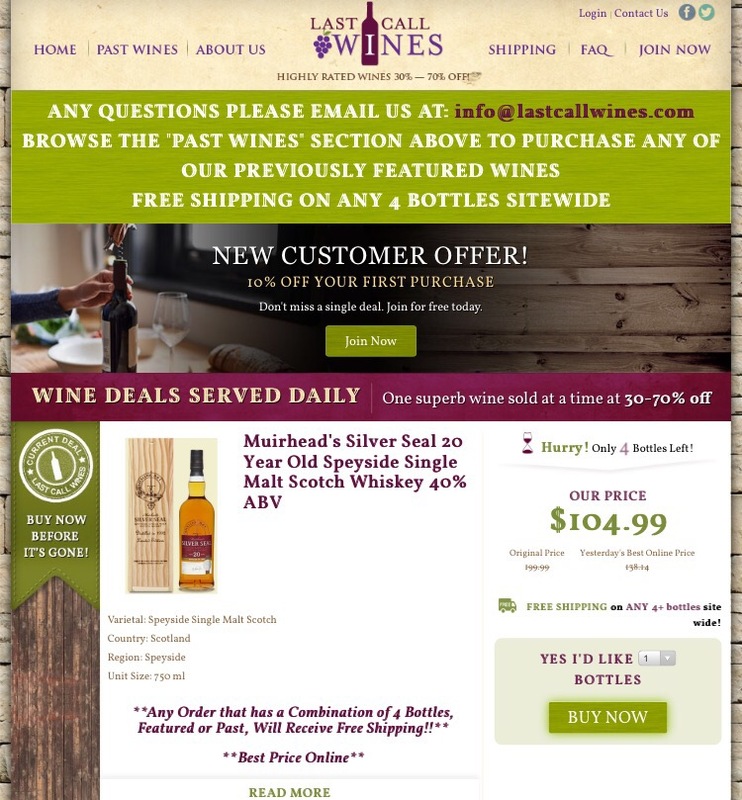 1 online wine retailer. The model is different from WTSO or Last Bottle in that there are usually a half-dozen or so wines for sale at a time. Free shipping on orders over $99. Location: San Francisco. Kudos: You are not required to buy a minimum number of bottles for free shipping and you can mix your order (e.g., 2 bottles of this, one of that, three of a third). WineShopper offers a $25 referral credit (click on the hyper-link and make a purchase and I get the $25). Caveat: While many of the wines offered are great bargains, I might be spoiled (or easily manipulated) but some of the “deals” on WineShopper are less than exciting (I do not consider 12% off to be that much of a “deal”). 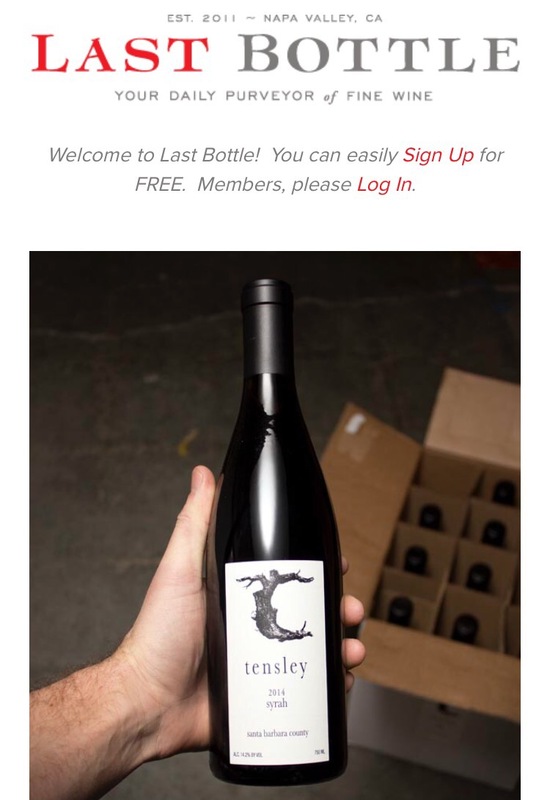 Last Call Wines—The Skinny: Seems to be a combination of the two different business models—Last Call has a single bottle up on the site at a time, but you can add other wines that are still “in stock” to your order. Free shipping is obtained when you order at least four bottles. Location: New Jersey. Kudos: Last Call lets you know how many bottles of each wine are left, and it is nice to have a second crack at wines you may have missed. Caveat: The website can be painfully slow at times and weeding through the other “still available” wines can be tedious since they do not remove the wines from the list that are sold out. As you may have noticed, that is only four and I said five. Well, these are the best and in my opinion, there is a drop-off after these four. WineAccess has a graduated savings system (the more you buy, the larger the discount), but since the wine comes directly from the winery, the customer service varies considerably (and, frankly, the writing on their daily emails is so over-the-top that I refuse to even read it—sorry, I have had Chad wine, and it is just OK). Note: I received no compensation for this article (other than the potential referral credits). Also, getting wine shipped to you from these sites is actually illegal in Pennsylvania. Yes, illegal. So all of my experience with these sites have happened in a place where it is not a crime to order wine. Places like Iraq. Or Afghanistan. Or Cleveland. This is great info. Confounding, at times, to understand all the ways wine actually finds a way home to our table. Cheers! I keep all my wine in Cellar Tracker and it is scary to look at the list of all the retailers where I have bought wine! Outlawed Across the Red River too. And yet, occasionally it magically appears on the porch. It must be Wine’s superpower. It’s second is to magically disappear just as quickly too. Trying to keep up with all the different states and the myriad regulations must be a huge headache.